To say that I’ve taken my sweet time decorating our place would be the understatement of the century. But you know what they say, slow and steady wins the race. Obviously, that means I’m going to win this marathon, big time. The “gold room” as we call it, is still a definite work in progress but it’s finally ready for it’s close up. I won’t even lie, I think my boyfriend is going to have to paint gold stripes in every place we live in from now to forever. He’s pretty good at it though, I mean, look at those babies. I would like to note that I had these antlers way before it became a “blogger” thing. Okay? I just adore my little piggy. My boyfriend has a thing with hoarding change. It used to be in a Dewar’s bottle. Dare I say, upgrade? Again I say, slow and steady wins the race. Looks awesome!! Great job on the stripes and I love the disclaimer about the antlers! Love it. I doubt my boyfriend would ever let me paint gold stripes in our apartment so I am a tad jealous 🙁 Looks fab lady! Know and love this room. It looks reallllll good. El boyf did a solid job on those stripes, but the decorating award clearly goes to you. This is so so fabulous! WOW! I love the gold stripes!! It looks awesome. And my husband and I have been married for almost two and a half years and living together in our home for longer than that and I still am not finished decorating. umm WOW that is so pretty and cool and just amazing!!! it looks awesome! also, i’ve never fully decorated a place. i had high hopes for this one, but now we are moving again! Wow this is SO impressive. I’ve wanted a rug like yours forever – they are so easy to clean and dress up any space! LOVE LOVE LOVELOVELOVELOVELOVE!!!!!!!!!!!!!!! The super skinny console is just too perfect!!!!!! I am in love with your gold stripes! They look amazing! When your apartment looks this awesome I don’t think it is a bad thing to take your time with decorating it! I’m obsessed with your living room!!!!!!!!! Now come decorate my place. I still love those stripes…you did such a good job. My walls are too textured for the straight lines, unfortunately. Girl. Boyfriend of the year award. Obsessed! 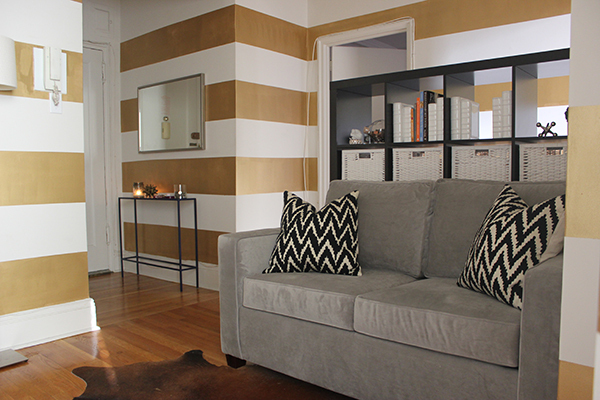 Seriously, I would kill for a place with gold stripes on the walls–I can’t even paint in my current apartment! Those gold stripes are fab. Just FAB. oh my goodness! is your bf for hire? he can come by my place next! love love love this. I LOVE the gold stripes. He did a great job! Hellllloooo beautiful gold stripes!! It turned out great! Your apartment makes me feel like I need to totally redo mine. Super cute, love the stripes, love the chevron, love it all! Pretty! I like how you kept the rest of the room’s colors simple with predominantly black and white furniture and accessories – it really makes the walls stand out. Also, loving the all-white deer. When I graduate from my tiny studio apartment that’s going to be my first purchase! Will your boyfriend come and paint our apartment too?? he’s hired. Like for reals hired. Those stripes are the jam! this is fab.. i’m with you on the slow and steady but I guess i actually need to start at some point. 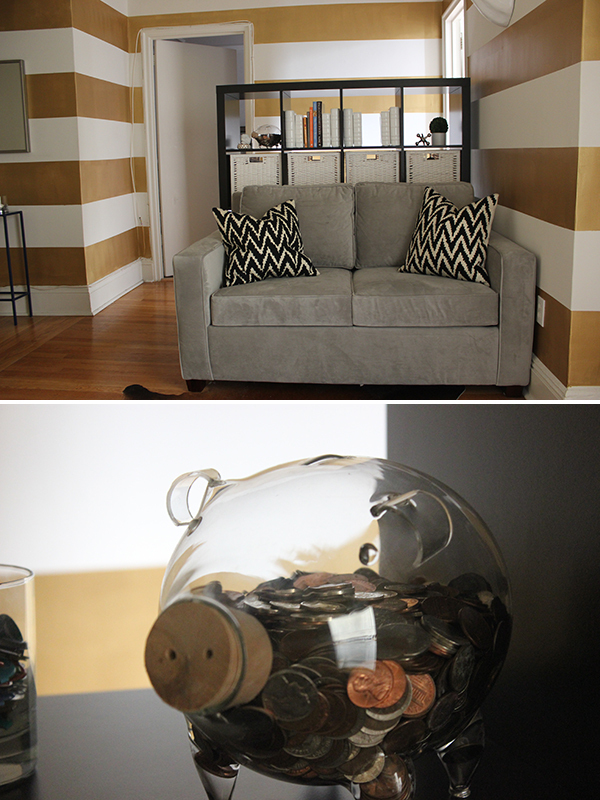 Love the clear piggy bank and the horizontal stripes on the walls! Love love love the room. 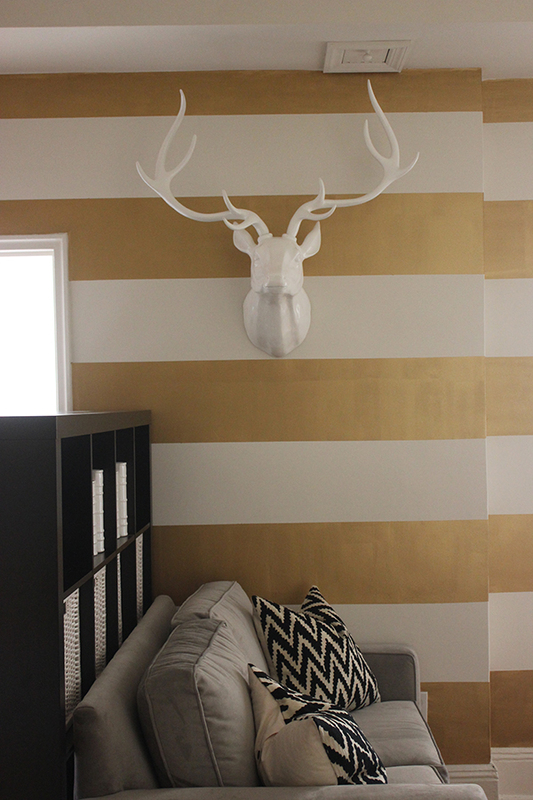 Stripes, antlers, foyer table, cowie, pillows…love!!! Boyfriend did phenomtastic!! Can you tell me what gold paint color you used?? Love the wall! !